The disappearance of EgyptAir Flight 804 has created a sense of uncertainty in global markets. 1. Concerns over EgyptAir: Market sentiment around the world has turned sour as the search for Egyptair Flight 804 continues. The Airbus 320 was carrying 66 people on board and flying from Paris to Cairo when it vanished from the radar overnight. Shares in Airbus (EADSF) and various European airlines are moving down in early trading. European markets are broadly lower. Shares in European holiday company Thomas Cook plunged by about 17%. The company does a lot of business in Egypt and investors worry that travelers will decide to avoid the region. 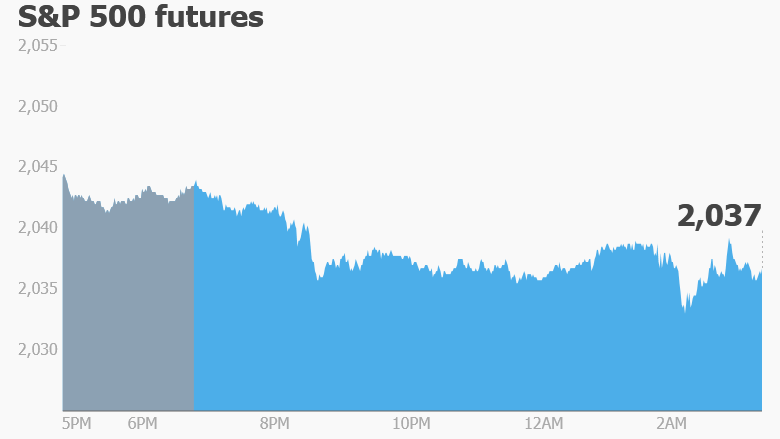 U.S. stock futures are taking a step back. Most Asian markets ended the day with modest losses. 2. Takeover time: German firm Bayer (BAYRY) has made an offer to buy U.S. seed company Monsanto (MON). If a deal is struck, it would be the latest example of consolidation in the agribusiness and chemical sectors. Last year, Dow Chemical (DOW) and DuPont (DD) announced they would combine to form a new industrial titan worth $130 billion. Shares in Monsanto are shooting higher premarket while Bayer stock is dropping by about 8% in Europe. 3. Earnings: There are two key retailers reporting quarterly results Thursday. Walmart (WMT) is reporting ahead of the opening bell while Gap (GPS) is reporting after the close. Gap warned investors earlier this month that sales were weak in the first four months of the year and its earnings report would likely disappoint investors. Meanwhile, investors are cheering the latest Cisco (CSCO) results from Wednesday evening. The company beat expectations and shares are rising premarket. 4. Focus on Tesla: Tesla (TSLA) announced Wednesday it is selling $2 billion of its stock to finance the increased production capacity needed to meet the demand for its new Model 3 car. The Model 3 is expected to hit roads by the end of 2017. About 375,000 orders have already been placed for the vehicle. 5. Monitoring the ECB: The European Central Bank is releasing the minutes of its latest monetary policy meeting at 8:30 a.m. ET. The central bank is working to combat deflation and encourage growth in Europe but fresh data on Wednesday confirmed that prices in the eurozone continue to slip back. 6. Wednesday market recap: It was a relatively uneventful day of trading on Wednesday. The Dow Jones industrial average and S&P 500 were essentially unchanged. The Nasdaq climbed 0.5%.